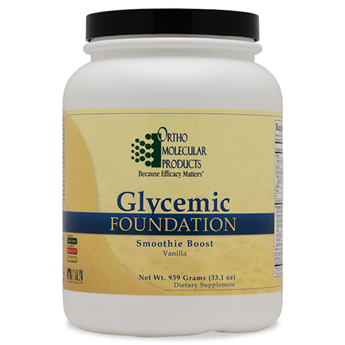 Glycemic Foundation is designed to to help promote healthy blood sugar levels. With its high fiber (12 g) and high soluble fiber (9 g) content as well as fermentable fibers from inulin and FiberAid, and 10 g of protein from brown rice, Glycemic Foundation helps manage the spike in blood sugar and insulin levels after a meal, as well as the associated afternoon drops, leading to less fatigue. Glycemic Foundation also provides 1.3 g of omega-3 fatty acids from organic flaxseed and has no added sugar. Lipoic acid is added for its powerful antioxidant support, insulin regulation, and AMPK signaling, to support optimal glucose disposal and weight management. Chromium is added to support GTF (glucose tolerance factor) production, critical for cellular uptake of glucose. Vanadyl sulfate is also included for its support of more optimal insulin sensitization. For the first three days of use, add 1 scoop (15.65 g) to at least 8 oz. of water or the beverage of your choice, stir and drink between or before meals one to three times daily. Increase dose to 2 scoops (31.3 g) after three days, or as recommended by your health care professional.